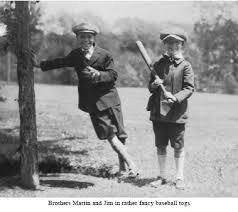 In Martin's memoirs, Undiluted Hocus-Pocus: The Autobiography of Martin Gardner (Princeton University Press, 2013), he makes several references to his early love of baseball, and an appropriate picture of himself with his brother is included. "I remember a summer when I was a boy at Camp Mishawaka in Minnesota; one of the counselors had me assigned to his canoe on a three-day boat trip, just so I could recite 'Casey' for him. I must have chanted it twenty times before the trip was over." The annotated book Martin assembled was preceeded by an article in Sports Illustrated in 1965, and a 2500-word essay in American Heritage (Oct 1967, Vol 18, No 6, pages 64–68), which had the subhead "The classic American baseball poem might have vanished if not for an actor's impromptu performance." 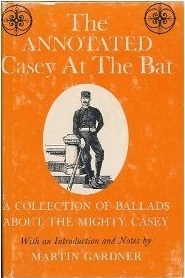 "No one imagines that 'Casey' is great in the sense that the poetry of Shakespeare or Dante is great; a comic ballad obviously must be judged by different standards. One doesn’t criticize a slice of superb apple pie because it fails to taste like crepes suzette." 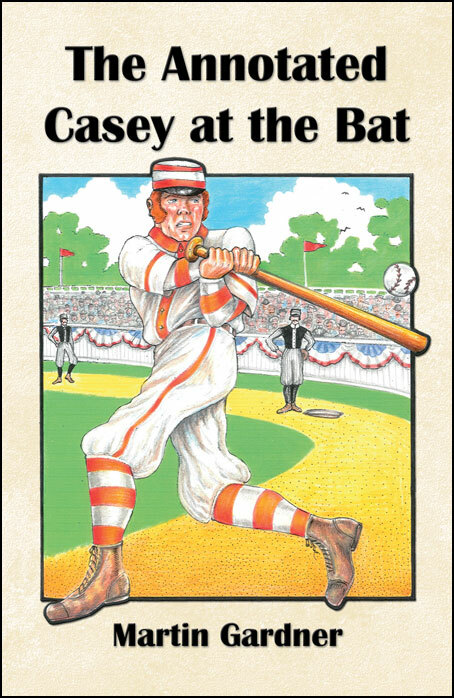 "No one, including its author, paid much attention to 'Casey.' Baseball fans in San Francisco chuckled over it and a few eastern papers reprinted it, but it might have been quickly forgotten had it not been for a sequence of improbable events." "How can one explain the undying popularity of Thayer’s poem? Possibly because it is almost impossible to read it several times without memorizing whole chunks; there are lines expressed so perfectly, given the poem’s intent, that one cannot imagine a word changed for the better. But perhaps the reason is because—with its careful build-up and its final fizzle—'Casey' is the incomparable, towering symbol of the great and glorious poop-out." 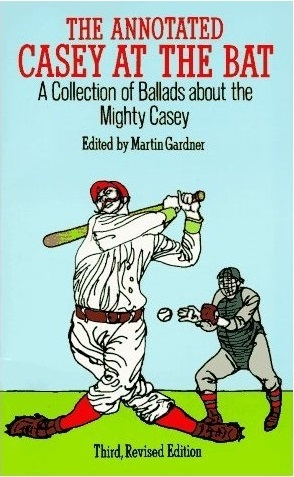 The Annotated Casey at the Bat: A Collection of Ballads about the Mighty Casey (Potter, 1967, Bramhall House, 1967, 18 + 206 pages) followed the essay before the year was out. A 2nd edition was published by the University of Chicago Press (1984, 216 pages), and a 3rd edition by Dover (1995, 18 + 231 pages). 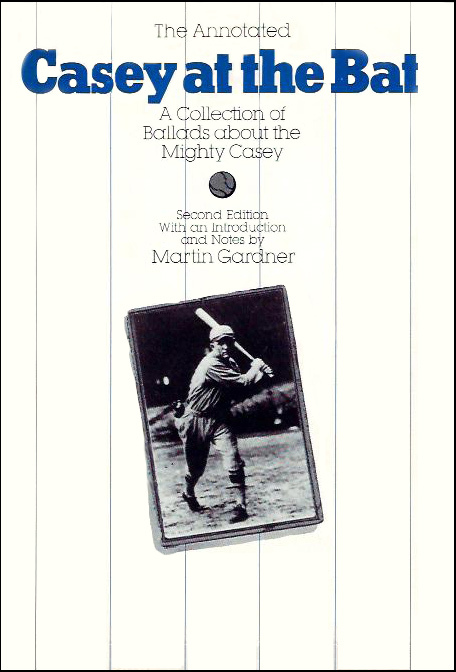 It was reprinted as simply The Annotated Casey at the Bat (The Battered Silicon Dispatch Box, 2008, 152 pages) a couple of years before Martin died. 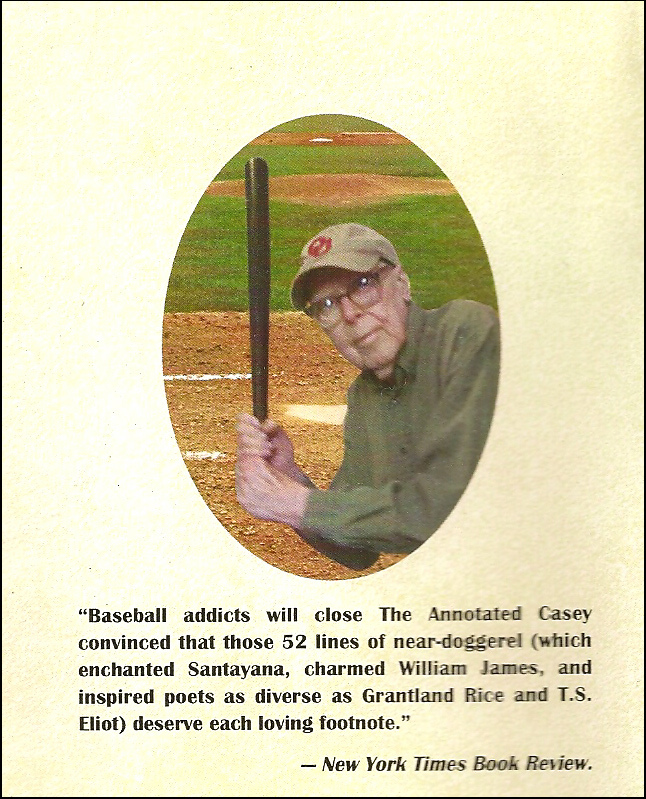 Martin was cajoled into posing for the photo shown for the back cover of the 2008 edition of The Annotated Casey at the Bat.